The highlight of Tanzania has to be a visit to fabulous Zanzibar where the water is clear, the spices enticing and the dolphins waiting. You are in for a lot of fun here. Ngorongoro Crater and the Serengeti did not deliver what we were expecting but other travellers have reported them to be magical places. The guide books talked about an incredible difference between the border posts in Malawi and Tanzania. I had expected the Tanzanian side to be extremely efficient and the offices to be housed in tip-top buildings. We found them in containers on the muddy roadside. We had $183 dollars with which to complete the formalities and make our way to the capital, Dar es Salaam. Fortunately we knew we were able to buy visas on the border (otherwise it would have been back to Harare) so we reluctantly parted with $100 and got three month multiple entry visas in our passports. Humpf, visas are a bit of a grizzly subject. We expected to pay a few quid for third party insurance but were surprised at the minimum $29 for a month. We were even more surprised at the $25 road tax. Oh dear we were left with $29 to get us 1000km down the road and exchanged $20 with the local boys for Tanzanian shillings. The officials packed us off quickly as it was their time to go home. We had entered the country later than anticipated because the time zone is one hour ahead of Malawi. What spectacular scenery. We had expected Tanzania to be flat and dry but it was green and mountainous. We drove past huge highlands, tea plantations and along winding roads. Absolutely beautiful. I suppose we should not have been surprised because the latitude is 6°south and therefore in the tropics. We drove for an hour before it started to become dark and the bush camping option was anticipated. There were people everywhere and just as we thought we were in for a night with many uninvited guests we spied a campsite which we shared with our German friends, Horst and Renate, and their unimog. They had travelled south through Sudan and gave us a few tips and succeeded in making us more excited about the possibility of driving home. The air was filled with the scent of Frangipani - beautiful. Oh it felt good to be on the road again and in the morning we were, indeed, on the road again ... for a very long time. The journey to Dar es Salaam was expected to be long but ended up to be longer than expected. Soon we needed some fuel and went to fill up the tank with our remaining $9 and a pittance of shillings. Oh dear, fuel prices here are high at 45p/litre. We didn't have enough money to get us to Dar so we used our shillings but kept the dollars for an impending bus journey to find Gordon and his hopefully fat wallet. At Iringa we stopped off at a few banks to get a Visa or MasterCard cash advance. Not a hope - this is Tanzania! They only deal with travellers cheques and hard cash. We only had plastic and were pretty desperate at this point. What happened next will stay with us for the rest of our lives. Benson, a bank employee, reached into his pocket and handed us 20,000 shillings - about £18. We were stunned. Reverend John in Malawi must have put in a good word for us or something. Perhaps we were being rewarded for all the tows out of the mud in South Africa. Our jaws dropped at the sheer kindness of this complete stranger. Wages here are considerably lower than in England and that money is of such a high value to a local. We were back on the road and continued our journey towards Dar with the knowledge that we would have enough diesel to make it. The route was beautiful along roads which twisted through the mountains. Passing through the Mikumi National Park was an absolute delight. The road cuts through this park and at intervals you have to slow down at giraffe crossing points. There were animals galore - zebra, giraffe and elephants just eating by the roadside, tucking into their food and watching us drive by. Normally we would camp as it started getting dark but we decided to push on and surprise Gordon and possibly Sally and Noel. Just as it got dark our lights packed up and we spent two and a half hours by the side of the road mending the switch unit. By 9pm we were off again. The road was good until about 15 km outside Dar when deep potholes greeted us as did people on cycles with no lights or sense of balance. Horst had given us directions on how to find the campsite. You go into town, turn left and follow the road for ages and ages until you reach Silver Sands Campsite. He was right and we arrived at 1.30am to find no Gordon, no Sally and no Noel. Humpf. Their tyre tracks were there though. By 7am Gordon rocked up having had an all-nighter with a couple of Dutch friends. Sally and Noel had already left for Arusha and it had been planned that we would all meet up in the next couple of weeks. The day was spent catching up with gossip and going into Dar to get a few chores done - primarily scoffing ice cream at the Sno-Parlour and drinking beer at the Sheraton. We wired the money back to Benson and discovered that getting a cash advance on a credit card out here is only possible at a couple of outlets and they give you a horrendous rate and cannot give you dollars, only shillings. Banks are only interested in cash and travellers cheques. 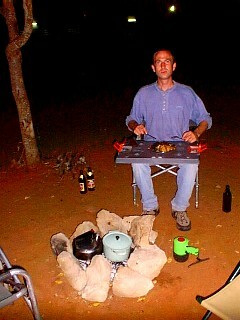 That night we had a delicious fillet steak cooked on the braai and made a few plans for our onward journey. The following day we decided to attack the chore list with a vengeance. Once at The Slipway we were enticed by the ice cream parlour which delayed us for a little while. Afterwards Punda was treated to a couple of new tyres. She now has a complete new set but we kept the two old ones to sell as they still had a lot of tread on (for African standards) but not enough to see us safely through the impending road conditions up north. That night we had a long awaited plantain curry. 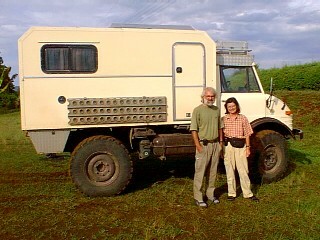 In the morning we headed off to the 4x4 centre to do a few jobs on the car. They offered excellent service and hospitality, giving us a bay and some chaps to do oil changes, etc. At the end of the day they didn't charge us a penny. We wondered if everyone in Tanzania was as generous. Perhaps this was compensation for the awaiting national park fees! Back at the campsite a few motorbikes turned up and we were delighted to meet up again with Chris - the Dutch guy that we spent some time with in The Gambia and last saw riding off in the opposite direction in Senegal. We had been wondering how he had been getting on. It turns out that he rode through central Africa and had a number of interesting stories to tell. We couldn't believe it. Congo (Zaire) was apparently a challenge, particularly as the roads were now very thin tracks having seen no traffic for a couple of years and the tropical vegetation had taken over. He and his Belgian companion had to put their bikes on dug-out canoes to cross the numerous rivers. Monday 13th was the day to go to Zanzibar and we were excited to say the least. Punda was packed up, locked up, secured in every way possible and parked next to the 24 hour security office at Silver Sands. Soon we were on the hydrofoil ($40pp return) to Zanzibar. It was really hot as we arrived in Stone Town. The initial impressions were of a crumbling old colonial town. Fortunately the touts were minimal and as Gordon had last visited Zanzibar about two weeks previously he knew his way around. The Kokoni Hotel offered us a triple room with en-suite facilities, breakfast and satellite TV in the room. We could catch up with some world news. That afternoon we went on walkabout. What a fascinating place. Stone Town is very old, full of Muslims (there is a requirement to dress appropriately) and bursting with history. Zanzibar was a main slave trading port and a number of museums tell the story. You can only get around the town by walking or taking Vespas through the winding narrow alleyways (reminiscent of Venice). A main road takes you along the coast and directly through the centre of town. Most of the buildings are falling down but great efforts are being made to restore them to their state of 100 years ago. The town is famous for its elaborate wooden doors which symbolise wealth. Indeed, some were spectacular having intricate carvings and big brass studs. There are many food stalls and carving vendors around. We tried baked cassava (bit like a dry spud) and a delicious drink made of freshly squeezed sugar cane mixed with lime and ginger. There are spice sellers everywhere selling home grown and imported spices. Of the most famous spices from Zanzibar is cloves. Until quite recently most of the worlds clove production came from here. The main area for generally lazing about isat Jamituri Gardens by the House of Wonders. Here you can buy very cheap local dishes and watch the dhows do their business on the sea. It was easy to visualise what it would have been like here 100 years ago. This was a typical colonial site for afternoon tea and you could imagine ladies dressed in big frocks prancing around with parasols. After sundowners at Africa House we went to a Chinese restaurant and ate the biggest crabs you have ever seen. They were massive and even Andrew struggled to finish his portion. We had run out of jasmine tea and couldn't get any anywhere but I managed to wheedle a freebie pot-full out of the receptionist. In the morning our Vespas arrived ata cost of $15 each per day. Instead of taking an organised 'spice tour' we decided to hire some mopeds and do our own tour. What a laugh. We had a bike each and it was Gordons first time on a motorised bike. Riding around the little alleyways was interesting, particularly as the bikes have right of way. The locals had to dodge more than normal when we emerged from around a corner. We made our way to one of the big spice farms about 19 km away but some local chap jumped out in front of us and demanded 1000 shillings each (£1) to go through his gate which if shut could block the main road. We told him where to go as there was nothing official about it and decided to take a long detour and enter the farm via the back door. Well, we were in for a treat. The back route took us down muddy roads, past villages that probably didn't see tourists very often. The vegetation was typically tropical and we had to stop briefly but regularly under a tree whilst a cloud dropped its load. The locals were fabulously welcoming and everyone cheered and waved as we wobbled along the track. At the spice farm we booked our guide who showed us around the plantation. We regularly use spices at home but know nothing about them. This tour was to enlighten us and we were amazed at seeing where some of the spices come from. Turmeric is a root, cardamom pods grow along the ground. We saw clove trees, chilli peppers, lemon grass, cinnamon, nutmeg, black pepper, aloe and the pink colouring you get in curries. It was fascinating. The locals love a fruit called 'durian' which has the worst smell you can think of and tastes a little better but leaves you with an onion aftertaste. Later our guide took us to a local village for some home grown coffee and a taste of delicious 'jackfruit'. Back on our Vespas we briefly visited the remains of some Persian baths before heading up to the beach and the slave caves. The drive down to the beach was interesting. A trails bike would have been more appropriate as we bounced along through rocks. Reaching the beach was like opening your travel brochure at your favourite page. We stared in amazement at the glistening turquoise sea, the white sands, the palm trees, the resting dhows and the lack of tourists. Within a few seconds Andrew was down to underpants and jumped into the warm water. I just went in with all my clothes on. Oh heaven. Sadly it wasn't long until we had to leave to return to Stone Town before it got dark. The route up from the beach through the rocks on the Vespas proved to be a little more tricky than anticipated. Slowly the revs reduced as the gradient increased to the point where the engine stalled and I lowered the bike to the ground in an out of control manner. I couldn't believe it. A 600cc biker bird falls off her moped. I was more embarrassed about my reputation than anything else. The bike had a few extra dents and chips when I returned it but fortunately the contract said nothing about damage so I handed it back without a conscience, particularly when you get ripped off big style when you hire these things anyway. That night we had a pizza followed by an evening of hard negotiating over the price of hiring a car for four days. As arranged our 4x4 Suzuki arrived in the morning but without a front propshaft and at a higher price than originally agreed. We sent the car away and refused to budge on the price. $20 per day is not a great deal of money for us but for the locals, not getting that money means a huge potential loss of income. They returned with another car but that too was sub-standard and we sent it away. The third car had a bald spare tyre with a hole in it and we tried to send that away too. However, by this point three hours had gone by and the locals were ready to dump us. We agreed to accept the car and drove off in what must be the worst vehicle in the world for dealing with bumps on the road. It started to rain very heavily and we were glad we weren't on our Vespas. The scenery towards the south of the island was beautiful. Lush green tropical plantations and street vendors selling rambutan and durian. You could smell the latter before you could see the stall. The road was tarmac and good until we reached Kizimkazi where the potholes confirmed the dreadful state of the cars suspension and tested the ability of our necks to hold our heads on. Not soon enough we were down on the beach where the locals were chopping up a staggering 45kg catch. Further on up the beach we negotiated the price of a room out of a choice of three hotels and booked our dolphin excursion for the morning. There were no other tourists to be seen along this massive stretch of white beach - just like being on the set of 'Castaway'. The Dolphin Shadow Hotel was very pleasant and served up a delicious dinner of Kingfish with bananas. March 16th was my birthday and we were up early to try on the snorkel gear and head out to the reef to play with the dolphins. In true African style the locals had arranged the excursion when the tide was a mile out and the boat stranded on the beach! They suggested that the tide would be in after 15 minutes. Fat chance! After half an hour we took a different boat and within a few minutes we were sailing the ocean in search of bottlenoses. It wasn't long before they found us and we leapt into the water without hesitation. Playing with dolphins for an hour was such a birthday treat. There were ten of them and were fabulous. We chased them around and watched all their activities - had to look away though as they rubbed up against each other and performed 'jiggy jiggy' as it's known here. Eventually it was time to leave our entertainers and we headed for a half hour snorkel on the reef. It was very nice but nothing like the Red Sea. After breakfast we made our way to the east coast in our bone shaker along a dreadful road primarily made up of jagged coral. The coastline is so beautiful here and there are very few tourists at this time of year. We had lunch at one of the beach cafes. They said that the coffee would take a while to make - "about 15 minutes". We were still waiting over an hour and a half later. Presumably they had to find wood, light a fire and boil the kettle. Their cooking was far more superior than their spelling and I ate delicious 'creeps with lime and sugar'. Later in the day a further financial negotiation at hotels along the coast followed and we chose the absolutely splendid 'Oyster Hotel' at $25 per night for three. We were the only guests. The veranda and restaurant overlooked the sea and as the gentle breeze blew through we enjoyed a fabulous fish dinner with birthday wine. The following day greeted us with beautiful weather and we decided to indulge ourselves and take up beach residence on the sun loungers. We had hoped to go out in a dhow at some point and when the locals asked if we were interested in a dhow trip to snorkel on the reef we jumped at the chance. Dhows are traditional sailing boats with sack cloth for sails - the ones you see in holiday brochures sailing off into the sunset. It was a lovely experience to spend a little time on one and I can confirm that the sails are made up of sewn together rice sacks, still advertising the merchants name. The water was clear and warm and the reef offered good entertainment, including lion fish. Gordon had not done much snorkelling and soon learned how to duck dive down to great depths. We returned to the hotel as the sun was setting and the skin starting to show a glowing shade of red (despite factor 15, mum!). We were tempted to stay put at the tranquil Oyster Hotel but decided that we ought to investigate the island some more. Our backs had recuperated sufficiently to take on another beating from the Suzuki. Through sand and mud, over bumps, in holes we bounced along for the entire day. Jozani Forest is the home of the rare red Colobus Monkey but we didn't need to go into the park to see them as they played in the trees along the roadside. They are small creatures and good fun to watch as they leapt from tree to tree. The hotels along the north east coast are where the rich people stay so we avoided that area and instead continued right to the northern tip of the island to Nungwi. Here we found tourists - loads of them. As such there was little negotiation on hotel prices and for our $24 we ended up in a pretty shoddy place. The beaches on the north and western side of the island are not as picture-postcard-like as those on the east but are better for swimming as the tide barely goes out. The beaches are narrow and within a few steps you are into chest high water. The chaps went snorkelling while I attempted to convert the remaining white patches to pink to match those coloured the previous day. That night we had a local dish of rice, fish and banana - there's a surprise. After breakfast the following day we headed back to Stone Town to willingly return the Suzuki then hop on to the boat back to Dar. The 75 minute ride to Dar took three hours as the hydrofoil refused to 'fly'. Back at Silver Sands we were pleased to see Punda again. She was fine - with the exception of a flat tyre! Monday was a day of chores - and not a good one. The tyre place checked the inner tube and reported there to be nothing wrong with it and sent us packing. The place to get cash was shut. The AA office said they could renew our international driving licences for £94 each (£4 in the UK) so we didn't bother. The rain poured. The computers crashed at the net cafe and the shops shut before we could do our food shopping. Tuesday was another day of chores - and a better one. The cash shop was open. The ice cream shop was open too! The supermarkets relieved us of much of the cash we had just obtained (twice London prices). Fortunately the markets offered good value fruit and veg. The washing didn't dry properly and went smelly. We heard of news of Zimbabwe and that the international community has stopped aid going into the country in response to Mugabe's claim on the land owned by the white farmers. Zim is on the brink of collapse at the moment and putting the farms under black control could be a disaster. Sadly, my experience of local peoples organisational ability and planning is not a good one. That evening we had dinner in the restaurant behind the Karibu Art Gallery where my chicken dinner arrived looking very much like fish. However the local dish of 'ugali' was very good. In the morning the tyre was flat again. 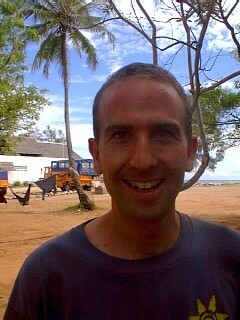 Whilst observing the flat state of it Andrew was hit on the head by a coconut falling out of the palm tree above. It is easy to imagine the expletives that followed. Back at the tyre centre Andrew insisted they find the puncture which they didn't. However, after blowing the inner tube up to near exploding point (good for river rafting) Andrew found the problem. It was a tiny nick where the inner tube had been caught between tyre and rim when they renewed the tyres a few days earlier. They reluctantly fixed it then tried to charge! Before heading up to Arusha we had a bit of food shopping to do and a bit of welding and grinding to the spare front output shaft flange (whatever that is). Just after lunch time we were on our way to Arusha and the national parks. The road winded through beautiful countryside, passing sisal plants that bags and mats are made out of. Some villages have reduced speed limits, others don't. As we rounded a bend into a village we were caught by a radar detector doing 88 km/h in a 50 km/h area. A £20 fine was demanded (for which you get a receipt) but we said we only had the equivalent of five pounds and a dollar. They agreed to it and sent us on our way without a receipt! We were later to discover that a number of truck drivers in foreign registered vehicles had been stopped around Tanzania for speeding - all doing 88 km/h! Half way between Dar and Arusha we decided to find a campsite and it wasn't long before a newly opened one greeted us. Located next to a river we were attacked by various biting creatures as we cooked our steak on the braai. Andrews attempt to replace the flange failed as the Dar engineers had re-ground it so much and the piece was now too small! 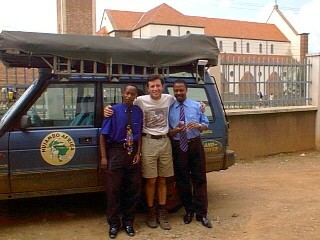 In the morning we didn't hang about very long before making tracks to Arusha. Kilimanjaro loomed up in front of us but unfortunately cloud cover meant that it wasn't as impressive a sight as I had hoped for. In Arusha we stocked up with fruit and managed to sellthe two old tyres for £20 which was a bargain, we thought, but we needed the space in the car. The road towards the Ngorongoro Crater was just diabolical. We lowered the tyre pressures slightly to soften the ride. I doubt the Suzuki would have survived this road. The road was over 60 km long and seemed to take forever to reach the campsite at Karatu. We were hoping for a relaxing fish dinner and a good planning session. However the owner of the site asked us if we would like to see some locals practice their singing and dancing routines. We said we'd be over later - but didn't really have any interest in going. They were apparently only performing until 9pm and by 8.45pm the boss came over again to see why we hadn't joined them. At this point we had just finished the washing up and hadn't yet got the maps out so there wasn't really an excuse to avoid the show so we said we'd go along for the last 15 minutes. As expected it turned out to be a performance just for us - and just what we didn't want because they are so naff. 45 minutes worth of music, dancing and acrobatics was followed by the hard sell of masai goods. There's a surprise! However it worked - we each carried off a masai blanket which we considered to be a practical item that could be used as a picnic blanket during England's only annual hot weekend. Friday 24th was to be our day of going into the crater and the day we felt our wallets implode. We were up very early but it was light by the time we had set up the roofrack into viewing platform mode. To reach Serengeti from the east you have to go through the Ngorongoro Conservation Area so you may as well spend a day at the crater to justify the expense. For two non-residents and a foreign registered car it costs $90 for the day ($25 per person for entry, $30 per car, $10 crater service fee - whatever that is). The permit lasts for 24 hours but if you wish to camp it is another $20 per person per night. We decided to exit in the evening so parted in total with $155 for three people and two cars. The conservation area is huge but it is the crater that most people come to this area to see. World renowned for its mass of wildlife we had high hopes. We had previously understood that the 20 km wide crater had sides which were too steep to allow the animals to leave. This is not so. Driving around the crater rim we were urged by masai wearing ceremonial headpieces to take photos of them, for a fee of course. They were most put out when we said no thanks. Down into the crater we expected to see wildebeest and zebra by the million. Instead we were greeted by millions of masai and their millions of cows, goats and donkeys. At last there was a hippo and a few flamingos. The morning passed and we saw very little of non-domesticated animals which added to the insult of paying such a huge fee to get into the park. Eventually we came across two hyena, loads of zebra and buffalo, a few baboons, 12 lion, 1 elephant and a few warthog. It must be the wrong time of year to visit the crater. The highlight of the day though was the sight of the crater from the top as the sun was setting. Exiting the crater was interesting - no wonder only 4 wheel drive cars are allowed down. I would imagine that in the wet it would not be possible to get out. Although it had been an enjoyable day this place certainly was not value for money for us (maybe the time of year was not good). Gordon had a problem with Comets suspension so we decided to stay at the campsite. HQ was closed so we made our way to Simba A campsite anyway with the intention of paying either directly or in the morning. Mr Guard only approached us to tell us not to park on the grass and then left us to it. The showers were terrible and had water piped in directly from the arctic. I didn't dare go to the toilet - just waited until it was dark enough to go behind the car. There was no electricity and nowhere to collect water for water tanks. The location was good though on the crater rim but the fee of $20 per person was a complete joke. Zebra frolicked in the middle of the campsite and a lone buffalo strolled by literally a few feet away from us. Ooh they are big close up. The chaps temporarily replaced Comets bush with a bit of inner tube. 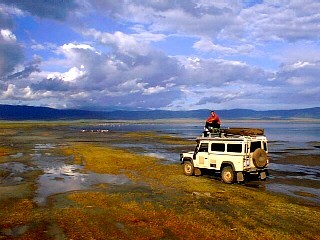 In the morning we drove west out of the Ngorongoro area before our 24 hour permit was up and entered the Serengeti. On the way to the gate we passed thousands of wildebeest and zebra. Lions were basking in the sun along the roadside. What a fabulous start to the day. At the gate we reluctantly parted with $195 for the day! ($25 pp, $30 per car, $20pp camping). The gate officials checked our permit to Ngorongoro but failed to notice that we hadn't paid for camping. We forgot to mention it! We were too busy obtaining a couple of bushes from the resident mechanic and were able to fix Comets broken part. More wildebeest, lion and lots of buffalo were on show throughout the vast almost treeless plains of the Serengeti. This is the Africa that you see in the films. The wildebeest congregate in the south east corner of the park at this time of year and are joined by zebra and hence followed by predators. There was a male lion lying by the road side and we parked about two metres away from it. I had the window down and was staring at it in amazement. They are so huge and so beautiful. Then it opened its eyes, lifted its head up and looked directly at me. For a fraction of a second we made eye contact and it was one of the most frightening experiences I have ever had. Its menacing yellow eyes made me look away and put the window up. I had previously believed that the great wildebeest migration took place throughout the length of Africa. In fact the animals move in a circle between the Serengeti and the Masai Mara in Kenya - not a great distance. Gordon spied a small cat in the grass which turned out to be our first Serval sighting. Afterwards Gordon stayed to take photos of the herds while Andrew and I went on for a drive around the park where we saw cheetah, a hyena den with babies, baboons and masai giraffes which have a different pattern to those further south. Here there are also Thomson's and Grants gazelles and Topi which we had not seen before. The Serengeti plains are so different to all the other parks we have visited. That night we stayed in an official campsite for the official fees. There were no showers, no electricity and toilets from mosquito hell. During the night we could hear the wind approaching. I realised I had not secured the roof cover properly after covering the viewing area so crawled out of the tent to place the loops over the hooks. The wind was blowing and it was just starting to rain. My arm reached over the back of the car before my head had chance to look over the top. I soon dragged the arm back when the hyena and I looked at each other at the same time. It had its head in the bin hanging off the tow bar. I don't know who jumped the highest but he was the first to retreat. In the morning we had hoped to exit from the north gate of the park directly into Kenya. It is physically possible to do so but you cannot get your carnet stamped upon entry into Kenya. There is a customs and immigration post at Serena HQ in the Serengeti so getting out of Tanzania would be easy. Instead we exited out of the west gate and drove for hours and hours along dreadful road towards Tarime. The expected two hour journey took five. This northern area is reminiscent of Transkei in South Africa. At Tarime we splashed out on omelette with chips before crossing the border into Kenya. Supermarket prices here are sky high but restaurant prices are quite reasonable. It works out cheaper to eat out than to eat in. A number of dishes are made using goat. Ugali is a favourite - made of ground maize like the pap you get in South Africa. Fish, bananas and rice seem to be the staple foods. Zanzibar is renowned for its spices which are used in abundance in their cooking. Curries are a big favourite. Be prepared for high costs at the border for insurance (based on the cc of your car and length of stay), road tax at $25 and visa costs depending upon your nationality. Banks do not allow credit card cash advances. These you can get from The Slipway, Coastal Travel and Rickshaws at quite a hefty commission rate. Fuel costs here are higher than in any of the Southern African countries at 45p/litre for diesel. Consider cashing in an insurance policy or seeking sponsorship to afford the national park fees. A trip to Zanzibar is essential !!!!!! For work on your car contact Mr Somji, 4 Wheel Drive Centre, off Nyerere Road, PO Box 20880, Dar es Salaam. The hydrofoil to Zanzibar costs $40pp for a return trip. It takes 75 minutes. The price varies greatly depending upon your bargaining skills. Buy all of your supermarket foods from South Africa or Kenya as prices here are huge. The local fruit and veg markets are good though as are local butchers. If you are going into the parks for a few days consider hiring a Tanzanian registered vehicle, or better still borrow a friends. It costs a pound to get a local car into the park for a day as opposed to $30 for a foreign registered one. Between a few people you can make a considerable saving. The area to go for Landy parts is Libya Street. Avoid CMC (main Landy dealer) who charge £160 for a set of brake pads.